Naruto 3-in-1 volume 9 is a collection of the individual volumes 25, 26, and 27. 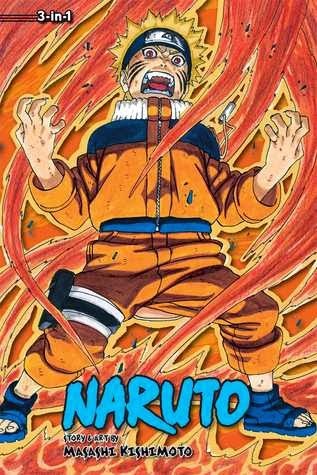 The first volume collected in this edition deals with a subject that Naruto fans have been waiting for since the very first volume of the series. 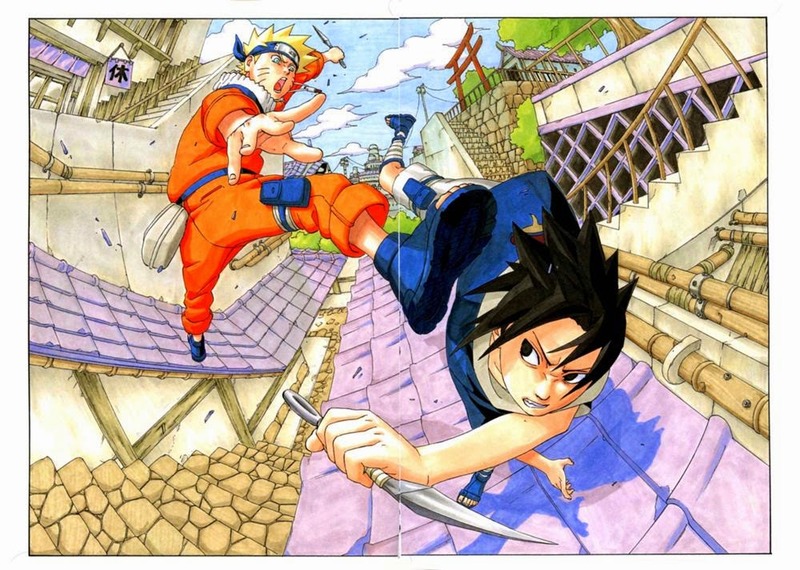 It’s the climactic battle between Naruto and Sasuke, his biggest rival. It’s a climactic battle because these events wrap up Part One of the series. While that wasn’t obvious to fans who original read it, it’s made very clear in hindsight. It doesn’t really matter because the hook here is simply reading about a no-holds-barred fight between two powerful and promising ninjas of Konoha, the Land of Fire. More specifically, this is a chance to see Naruto and Sasuke’s respective special abilities measured up and potentially put an end to fan debates that have existed since the beginning of the series: who is the strongest shinobi? The battle takes up all of volumes 25 and 26. For better or worse, it’s made up of as many fight scenes as there are flashbacks. I believe it’s for the best as the flashbacks simultaneously develop Sasuke’s past, specifically his childhood while also providing additional information regarding Sasuke’s brother, Itachi, and the Uchiha clan. As one of the more mysterious figures at this point in the series, these flashbacks are welcomed and make for a good read. I can’t exactly same the same of the Naruto and Sasuke fight in these chapters. They’ve had very small fights in the past and all of those fights are revisited here to some degree. Mostly though, it’s a one for one clash of each of their special abilities with Naruto winning some and Sasuke winning some others. It’s the second time I read this fight and I couldn’t help but notice that Masashi Kishimoto’s storytelling did a better job pointing out the thematic relevance of the fight than he was at providing the reader with an original and entertaining battle. The location itself adds quite a bit of thematic relevance to the fight. Fighting at the Valley of the End, a legendary location where the first Hokage of Konohagakure fought one of the greatest shinobi of the Uchiha clan echoes the fight between Naruto and Sasuke. Furthermore, the historical battle ended with Sasuke’s Uchiha ancestor defecting from Konoha after trying to destroy the village of Konohagakure, which Hashirama Senju, the first Hokage, was defending. The Nine-Tails fox demon which now resides in Naruto was also present at that legendary battle. 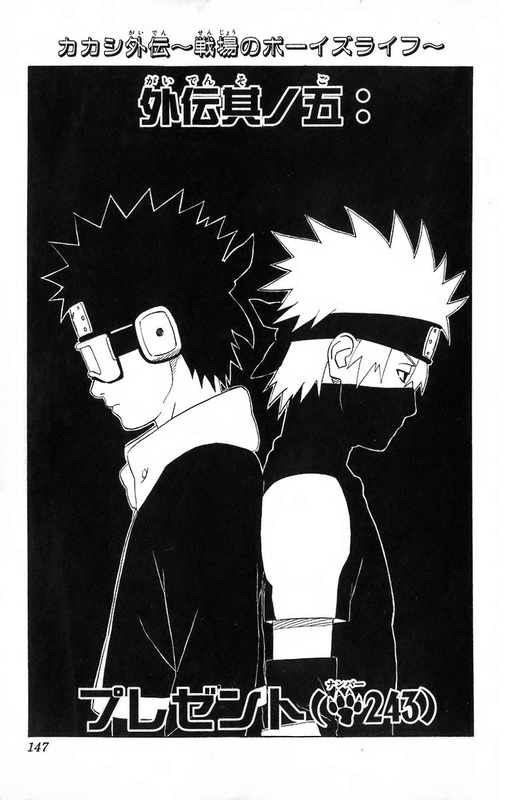 The title page to Chapter 226 with Naruto and Sasuke. A lot of this history is unknown or not completely understood by Naruto and Sasuke. What is evident to them is the more obvious clashing of both their abilities. Those abilities include: Naruto’s fox demon chakra versus Sasuke’s Sharingan eyes, the Rasengan (taught to Naruto by Jiraiya) versus the Chidori (taught to Sasuke by Kakashi), and Naruto’s desire to gain friendship with others in order to better himself versus Sasuke’s desire to sever emotional ties in his quest to attain more power. I feel as though Kishimoto crumbled under the weight of so many themes because the resulting fight is made more meaningful than it otherwise would have been but it’s so lackluster that I find it quite boring. It’s predictable in its execution and it’s very stiff due to the storytelling’s significant decompression. You have panels that are meant to make both fighters look as though they are moving in slow motion and the result is seeing mostly static images with characters moving, little by little, to crash in splash pages that are nothing more than big chakra explosions. Visually, it’s very anticlimactic. Kishimoto spend many hundreds of pages establishing these two as characters with some surprising depth only to reduce them to casualties of so-called cool explosion. The result is a very simple fight that lasts longer than it should and it leaves the reader wanting more while also being disappointed at the poor execution. The real kicker is that right before disappointing you, Kishimoto proves to you that he has the skill to pull off this kind of storytelling. I still can’t wrap my head around how disappointing this particular series of chapters are and it left me feeling cold. I’m really pleased to say that the final third of this omnibus collection (volume 27) is a joy to read. The first three chapters deal with the aftermath of the battle. Naruto is brought back to Konohagakure by Kakashi. Back in the village, Kishimoto gives the reader time to catch up with the various Konoha shinobi who were wounded during the mission to retrieve Sasuke. We get to see some interesting healing techniques and it’s nice to see some familiar faces after so many chapters focusing on a single battle. The seeds are also planted for what the main three shinobi (Naruto, Sasuke, and Sakura) will be doing during the three year gap between Part One and Part Two of the series. In short, they’ll all be training under one of the Three Legendary Sannin. Naruto will continue his training with Jiraiya, Sasuke has joined up with Orochimaru and will train with him, and Sakura has asked to study under Tsunade who has agreed to take her on as an apprentice. It feels like setup but it’s delivered as character development. Kishimoto strikes a nice balance in wrapping up the plot of Part One, setting up the plot of Part Two and giving everything a nice sense of closure. I find that Kishimoto is very good at this sort of story. He’s good at providing downtime that feels relaxed to the reader while also sowing the seeds of future stories. Uchiha and a young Kakashi. The rest of the volume is made up of an interlude story that focuses on a teenaged Kakashi. I really loved these chapters. They were the highlight of this 3-in-1 volume. Kakashi is such a mystery because we know next to nothing of him. These chapters, among many other things, tell us how Kakashi got his Sharingan eye. It also does a very good job at filling in a generational gap between the Fourth Hokage, Kakashi’s generation, and Naruto’s generation. Previous chapters have told us that Jaraiya trained the Fourth Hokage. We also know, though I admit I’m not sure if we learned this in a previous chapter of if we learn it in this volume for the first time, that the Fourth Hokage trained Kakashi who then trained Naruto. What is important to know is that there are four generations of shinobi that have all trained each other and the history of one of those generations is developed in this volume. It’s all very interesting and Masashi Kishimoto gives the story the ultra-cool flair it deserves. The first three chapters of this volume put a somewhat abrupt end to Part One of Naruto but this interlude does a very nice job of bridging the gap before the beginning of Part Two. For that reason, and for being an interesting story in its own right, I’m quite pleased with it. Overall, this is yet another strong collection of volumes. Sasuke has never been a character I’m overly found of and I find his quest for more power to be one of the more boring aspects of the series, even if it ties into Naruto’s own story quite nicely. Because of my dislike for Sasuke, it’s difficult to get really excited about chapters that focus on him so much. For that reason the first half of the collection isn’t as good as the volumes preceding it and the volume following it. It also doesn’t help that the battle between Naruto and Sasuke just doesn’t work well, neither visually or as an entertaining fight. I really enjoyed the last volume, though. The quieter stories set in Konoha village are a delightful change of pace. The real treat of this omnibus collection is volume 27 due to Kakashi’s story, which is great. It’s the breath of fresh air that the series needed at this point. While being a breath of fresh air the story is not breezy. It’s tense, informative, and pretty tragic. It proves once again that the lives of shinobi are very difficult and full of hardship. They have a noble, yet very difficult, job and they should be treated with respect. It certainly also gives you pause and makes you rethink your childhood dreams of becoming a ninja. It’s never been easy to be a Konoha shinobi and this story foretells that there are more hardships awaiting our heroes in three years’ time. The next volumes have plenty of surprises in store and I’m looking forward to reading them already.